Hello to all my friends, family and well wishers all over the world! This past summer we had many visitors from all over the globe. I enjoyed hosting Rob Wallace in my home for 10 days while he checked on HEAL projects and some of the HEAL students. He is from Canada and a professional photographer. Arif Alibhai from HEAL was here and I always love seeing him during his visits. I am so grateful for the whole HEAL organization and the huge support they have given us for many years now. There are many successful young people now working in various areas having been supported by them. I also had visitors from California, Hawaii and several other places. It is great seeing so many old friends. With all these visitors we also were very busy with our hostel with many guests. Income from the hostel really helps with the ongoing running of our Rescue home. I had a four legged visitor who came in scared, starved and pathetic. I never planned on having a dog again but there was no way that I could turn this little dog away. I have named her Cleo after the dog I left behind when I came to Uganda 22 years ago. She is now very healthy and active. The vet thinks she is about 7 month old. We recently helped a child headed family of 3 boys and a girl who had been living on land that was owned by the Queen Mother of Kabarole. She is wanting to develop the area and they had no where to go as they had no extended family left. David and I went to talk it over with her and she was extremely generous and gave us enough money to help them reestablish themselves in another area. We have found good land for them and they are now building a house on it with the help of David. We also became involved with 5 kids whose parents abandoned them. The child protection of the police worked with us and we found their parents but the father then committed suicide. Their mother is now back with them. She had run because she feared for her life when her husband drank too much. We are helping her get some beds and bedding as well as getting established with her 6 kids (she had a baby with her when she left). 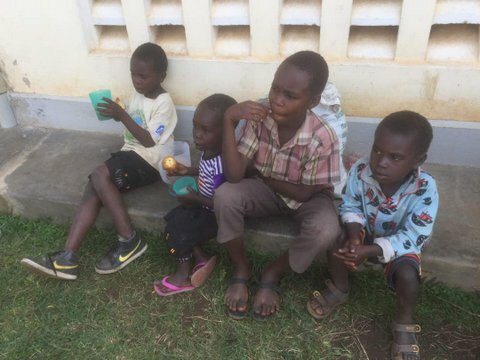 If anyone wants to sponsor one of these kids the family is in huge need. Just email us or go here. On the 4th of July I met a young family that I want to introduce. 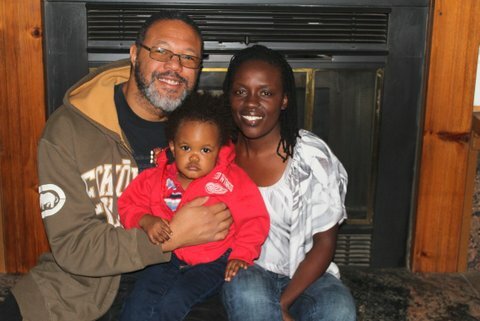 They are Greg and Jo and their young son is Israel. Greg is an African American and Jo is Ugandan. Greg has been in Uganda since 2008 with the Calvary Chapel and he now is volunteering 2 days a week in my office. It is my prayer that they might become an active part of YES. Personally I have been facing quite severe back pain for some time that has increased and nothing is helping. I traveled to Kampala and had an MRI that showed drastic deterioration on several disks and the doctor felt like I needed surgery as soon as possible. I am now in New Delhi, India having my surgery! My amazing staff are all prepared to continue making sure all the kids are doing OK and the program is running smoothly. Please have patience with me in returning your emails as I’m not sure how long the recovery process will take. I’ll try to post some updates on my Facebook page. As always I thank God for so much and all of you for your continued support. I do request your prayers for this rather scary surgery in India but I know God is in control.